Last year, Jonathan Thomas collected $45,000 on Kickstart for his video editing program OpenShot , which is helping him to finance the development of version 2.0. It will be based on Qt5 and will finally also run on other operating systems. However, the work is not progressing as quickly as Thomas originally planned. When I was writing this article, version 1.4.3 was still the latest release, and this is the version that package managers in the most recent distributions also have. The user interface in OpenShot is similar in structure to that of Kdenlive but looks far more clear-cut: All the important clips end up at the top left in the media management section. At the right is a preview, and at the bottom of the window is a timeline (Figure 7). You can drag and drop here to arrange the individual clips. Dragging the movie snippets close to one another, causes them to latch, thus facilitating positioning. 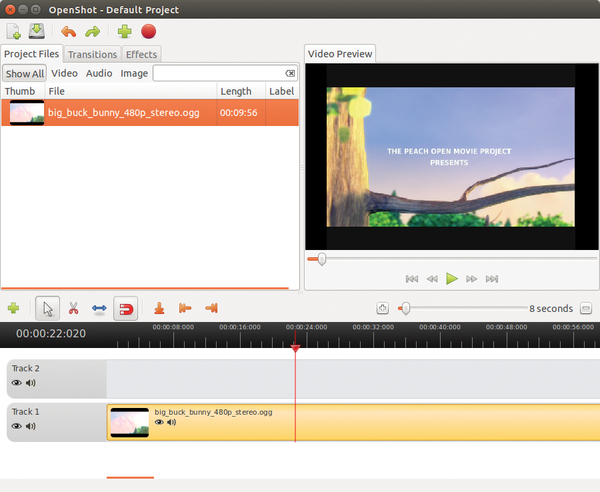 Figure 7: OpenShot 1.4.3 with its clear-cut user interface is mainly targeted at video editing newcomers. This process, however, only works on a single track: To align two clips, one on top of another, you have to push them around painstakingly with the mouse. What makes this even more difficult is that the timeline does not allow you to work with to-a-frame accuracy. After you have dropped the clip into the timeline, you can use the matching tools to edit it. OpenShot can also split a clip at the time bar, but these are the only cutting tools. 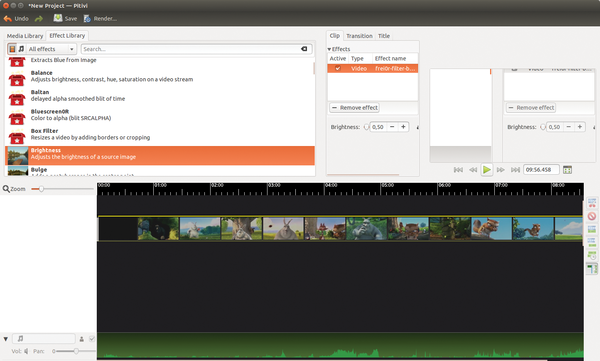 OpenShot 1.4.3 relies on GStreamer in the background to process movies. On our lab machine running Ubuntu, it generated blocky artefacts and stripes in the preview. The built-in effects and crossfades are all designed for show, much as in LiVES, including effects for distortion, glowing, and simulating an old movie. The settings for the effects must be applied painstakingly in a separate window with a preview that is far too small. Most effects, such as color correction, only offer rudimentary settings. There is no option for controlling via keyframes. A wizard creates simple titles; however, it needs to resort to the services of Inkscape to do so. In combination with Blender, OpenShot can create animated 3D titles. To export, you simply select a default, such as DVD or Blu-ray. Experts can configure the settings, such as the video codec. However, unlike Kdenlive, OpenShot does not let you tinker with more intricate settings. Whereas OpenShot only lets you change the bit rate in fixed increments, Kdenlive lets you enter an arbitrary bit rate. If needed, OpenShot will help you upload the movie you create directly to YouTube. The user interface in the Pitivi  editing program is highly reminiscent of OpenShot: The area at the top left manages all the imported media; in the middle, you can see the settings of the assigned effect. To the right is a preview display, and the timeline waits for you to load clips at the bottom (Figure 8). Figure 8: The user interface in Pitivi is oriented on popular editing programs as well. For a new project, you can define the video settings via a template. However, Pitivi on Ubuntu 14.04 has just a handful of templates from which you can select, and they only support US formats, while ignoring, for example, the popular AVCHD format. To create your first video track, simply use drag and drop to drag an imported video into the timeline. More tracks are created automatically as soon as you store a clip under an existing track. You can edit the clips, as in OpenShot, in the timeline by dragging their ends together with the mouse. Pitivi does not show you a preview while you are doing this. To edit with to-a-frame accuracy, you need to enlarge the timeline to the max. If you have enabled gapless mode, the clips act as if they are magnetic, which makes aligning them easier. Additionally, Pitivi can sync clips based on their audio tracks. It is hard to understand why there isn't a single-frame preview. The only available cutting tool splits the clips at the position of the time bar. In its video and audio tracks, Pitivi displays yellow rubber bands that help you change the brightness or the volume of the selected clip. You can click with the mouse on a line to add more control points, thus gaining the ability to influence the characteristic of the curve in a more targeted way. The rubber bands do not offer any curve settings, and you thus need to insert multiple points to approximate a smooth crossfade. The rubber bands also only let you manipulate the brightness of the volume; effects are always applied to the entire clip. Like OpenShot, Pitivi also mainly offers decorative effects; for example, you can give your clips cartoon-like effects or artificially "age" the movie. When you export the movie, you can select the file format, the frame rate, and the compression method. Experts are allowed to manipulate compression. Pitivi relies on FFmpeg for the export feature. The developers are currently working hard on Shotcut : Punctually every month they release a new version. When this article was written, the latest was version 14.09 from early September (Figure 9). On their website, the developers provide a precompiled version of Shotcut. You can download the archive to match your distribution, unpack it, and then launch the shotcut script in the Shotcut.app directory. Figure 9: Grab the resizing area at the left margin of the video window to expand the area horizontally. Shotcut uses MLT in the background to process videos and can thus harness the graphics card for computations – the developers, however, say that this feature is still experimental. When launched, Shotcut comes up with what is – to a great extent – an empty window. As soon as you open a movie, Shotcut starts playing it like a movie player. The two white triangles on the edges of the timescale are the only indications that this is a video editing program. If you move them, you are cutting off the start and end of the clip. However, you need to be very dexterous to cut the movie with to-a-frame accuracy in this way. The View menu item displays a tab with more tools on the left-hand side of the window. This tab also includes a group of effects that Shotcut refers to as filters. Filters always apply to the entire clip currently open. The filters themselves typically only offer a few options, which are finicky to set up because of the small slide controls. However, Shotcut shows the resulting effect immediately as a preview. Settings that you have already applied can be stored as templates, if needed, so you can apply them quickly to another movie later on. Once you have applied effects to a clip, you can add it to the playlist. Shotcut plays this list back from the top down, thus giving you a complete movie. To edit an entry from the playlist retroactively, you first need to open it in the preview in a time-consuming process (click on the menu icon at bottom left and select Open As Clip). As an alternative to the playback list, you can first open what is initially an empty timeline. Once you have dragged a movie onto it, Shotcut automatically creates a matching track. However, you explicitly need to add any more tracks you need. Video clips latch onto important points, such as the time bar or at the end of another clip. To trim the clip, you need to drag its ends in the timeline. However, you are blind while doing this, because the preview only shows the frame at the position of the time bar. Shotcut currently offers only one cutting tool, which splits the currently selected clip at the position marked by the time bar. You can simulate crossfades with the Fade Out and Fade In video filters. To export the edited movie, open the matching tab and select one of the numerous defaults when you get there. Experts can configure more granular settings. If so desired, Shotcut will stream your work to a Melted video server – an industrial-strength media player for TV use. MLT was originally designed for collaboration with Melted.